The Asus Transformer AiO has just been revealed by Asus as their next big thing on their Transformer line of Android tablets. The operative word in the last sentence is “big”: This huge 18.5 inches screen may be used as an “all in one” desktop PC, docked into its vertical stand, but then you can unplug and carry it with you, transforming it into the biggest tablet PC you could have. 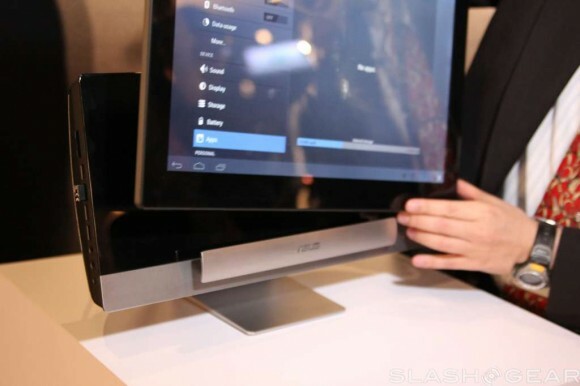 Little is known at this time about the hardware details on the Asus Transformer AiO. The only data we could get is that the screen includes a multitouch sensor capable of reading up to ten fingers. The screen is driven by a dedicated graphics procesor unit while the whole system runs on an Intel Ivy Bridge processor. As a side note, Asus investment on Windows / Android duality does not end with their Asus Transformer AiO launch: Asus announced a partnership with Bluestacks in order to include Android apps and games compatibility into their upcoming PC computers. Let’s hope then that their Asus Transformer AiO is only the first of several new ways of bridging together Android and Windows into Tablets and Desktop PC.